SECRETS CAPRI Unlimited-Luxury™. A new and better way to have it all. Perfectly placed on the Mexican Riviera, Secrets Capri Riviera Cancun is a striking adults-only resort dedicated to couples and singles. This romantic hideaway of classical Mediterranean architecture provides the majority of all guest rooms and suites with a fabulous view of the Caribbean Sea and sugary white sand beach. SECRETS CAPRI Riviera Maya- The Secrets Capri, a proud member of Preferred Hotels & Resorts Worldwide, is superbly nestled amid 71 acres of lush greenery bordered by a sugar-white beach and a mesmerizing multi-blue Caribbean Sea. 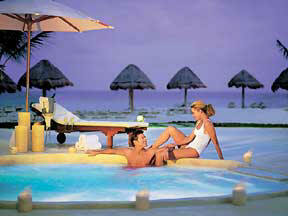 Nearby barrier reefs and Mayan archaeological sites heighten this perfect location. This tropical oasis was designed to reflect the charm of a Mexican hacienda with a splash of Mediterranean flavor and truly embraces the splendor and fine services of a top quality Resort. The lobby with polished marble floors and tasteful furnishings opens to a grand staircase over a waterfall and lagoon. 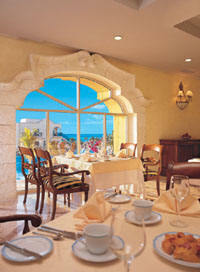 Rich oil paintings, landscape murals, chandeliers and great vistas of the Caribbean beyond create a lasting impression. Dining is a la carte with an array of dining choices. Himitsu specializes in a fusion of Pan-Asian and Oriental delicacies, Oceana with breath taking views of the ocean offers fresh gourmet seafood in a romantic setting while Capri explores exotic flavors of the Mediterranean cuisine, keeping with the pace of the latest cooking trends and Epicurean classics. La Riviera introduces the best in Mexican fare and the Seaside Grill right on the beach is easily found by aromas of grilled seafood and meats. Note: Reservations requirements does not fit the philosophy nor is a wearing a wristband. The Spa at Secrets Capri offers more than 30 restorative treatments and hydrotherapies, including the one of a kind "Spa Garden" in lush gardens where whirlpools featuring cascading waterfalls invite guests to lounge in warm shallow water with penetrating jet sprays; a place to soothe the soul and feel renewed. Recalling the elegant opulence of a Mexican Hacienda, Secrets Capri will embrace you like an old friend. Sweeping arches welcome you, sun soaked colors seduce you and meandering pathways lead the way to a pristine beach as perfect as the day the first wave lapped to shore. Your comfort is paramount at Secrets Capri Riviera Cancun and personal concierges on each floor take every guest into their care. Luxuriate in effortlessly elegant accommodations featuring every convenience, from marble bathrooms with Jacuzzis to stocked mini bars, 24 hour room service, satellite television, internet access and CD/DVD players. Each of our 288 air-conditioned rooms is delicately appointed with fine fabrics, tropical hardwoods and Travertino marble floors. 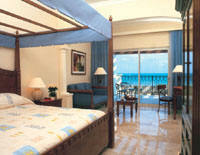 Furnished patios or balconies frame breathtaking ocean or garden views. Spacious junior and presidential suites offer up to 1900 sq. ft. of space. Room amenities include: private and furnished patio or balcony, full marble bathrooms with a jetted Whirlpool bathtub, a separate shower, water closet and double vanities, equipped with phone and sound speaker, bathrobes & slippers, 27" satellite television, air-conditioning with in-room climate control, sound system with in-house music channels, CD/DVD player, direct dial telephone, high speed internet data port, alarm clock, electronic in-room safe, coffee/tea maker, a mini bar stocked with beer, soft drinks, juices and water. The 5 Star Secrets Capri is destined to be one of the regions most distinctive and lavish resorts. Bordered by sugar-white beaches and the brilliant, crystal clear Caribbean Sea, this tropical oasis truly embraces beauty and splendor. Surrounded by lush gardens, the spacious 1500 m2 swimming pool graces the centerpiece of the property with swim-up pool bar, outdoor Jacuzzis and both pool and beach waiter service. Those who favor more energetic pursuits will appreciate our state of the art cardio conditioning facility and fitness center. A full range of cardio-vascular machines, free weights, treadmills, lifecycles, step machines and aerobics classes help your body reach its fullest potential and a post-workout pause in the sauna, steam room, whirlpool or plunge pools is its welcome reward. At The Spa at Secrets Capri relaxation comes as naturally as breath itself, with a menu of more than 30 restorative treatments and hydrotherapies to choose from, including the resorts one-of-a kind spa garden - a relaxing retreat and the first on the Riviera Maya. Hailed as the Riviera Maya's newest spa culture, this unusual jewel is situated in an outdoor, lush, tropical garden setting and epitomizes the Secrets Capri Spa experience of romance, indulgence and rejuvenation. Whirlpools feature cascading waterfalls that allow guests to lie in warm shallow mineral water while water jets penetrate the skin. Also located in the Spa Garden is the Treatment Casita Facility, comprised of two Couples Treatment Suites and three individual treatment rooms. Found in the indoor section of the Spa are private Vichy and Swiss Showers, Jacuzzi baths and five additional treatment rooms. A relaxation lounge, saunas, steam rooms and private showers are also available in the indoor section. The Spa combines hydro-therapy and indigenous treatments creating a refreshing, invigorating and peaceful experience. Spa pedicures, spa manicures and spa facials round out the services and are all available in the resort's full service salon. The Spa at Secrets Capri exclusively offers Pevonia Botanica face, body and spa care products and treatments. The Pevonia line contains no alcohol, lanolin, mineral oil, artificial color or artificial fragrance, and is strictly noncomedogenic. Pevonia's full range of ecologically-balanced products provides the most nourishing, natural ingredients the earth has to offer. 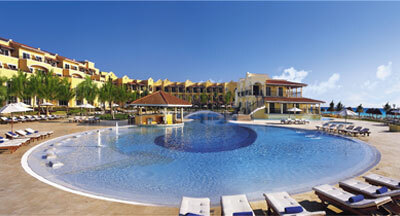 Secrets Capri Resort and Spa stands well apart from the ordinary all-inclusive. No buffet lines, house brands or overbearing staff. Instead, a la carte service of the finest food and beverages, a superior selection of amenities and a team of professionals who make your comfort their only concern. 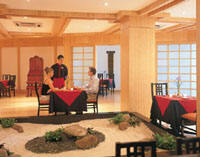 * Specializing in a fusion of Pan-Asian and Oriental delicacies. * Continental cuisine with a variety of specialty items and classics. 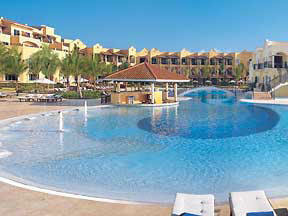 * Located on the beach, offering Continental and Mexican snacks during the day and an a la carte steak house at night. Music & Comedy - Musical entertainer, Jimmy Bryant, and Comedian, Al Klemick, will be bringing comedy and entertainment on property during the entire month of February. Klemick adds a unique style of comedy to the Riviera Maya and has performed at top comedy clubs such as Funny Farm, the Laugh Factory and Comedy Club. Exceptionally talented, Bryant, has been a large part of the music industry for years with well-known artists such as Dolly Parton and Tony Orlando. Stargazing Rock n? Roll Party - Now guests can dance the night away to a live All-American rock n? roll band at our weekly Stargazing Rock n? Roll beach parties. Mingle around the bonfire on the beach, meet new friends or lay back with an ice-cold beer and gaze at the stars through beachfront telescopes. Great family fun! World Famous Magician - Beginning January 2, world famous magician, Kevin Barnes, will be performing one night a week during the month of January. Duping audiences all over sin city for the past 15 years, Barnes has performed at all the major Las Vegas hotels, including intimate performances for Tiger Woods, Jewel and Pavarotti.